Campus Recreation and the Morris University Center (MUC) have partnered to create a satellite fitness facility for SIUE students in the Student Success Center (SSC). An open house in the SSC, Room 0206 on Monday, Jan. 9 featured the converted space that is now a small work-out facility, similar to the concept featured in SIUE residence halls. This allows expanded recreational opportunities for students, particularly during hours when the MUC is open and the Fitness Center is closed. The room features cardio equipment with a treadmill, two ellipticals, and recumbent stationary bike, as well as a dual adjustable pulley, providing an opportunity for resistance strength training and stretching mat. In addition to the expanded hours, Campus Recreation hopes that by adding this convenient option across campus, more students will have the opportunity and be encouraged to engage in physical activity, which holds a number of benefits including reducing stress levels, lowering risk for illness and promoting a healthy lifestyle. 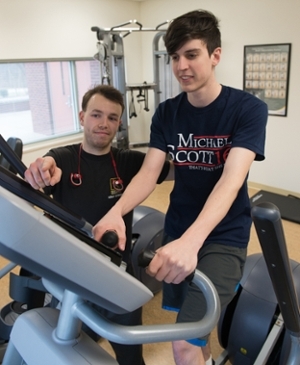 Photo (L-R): SIUE sophomores Eric Arnold, mechanical engineering, and Michael Scott, computer science, check out the new satellite fitness facility in the Student Success Center.